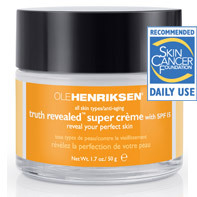 I was recently sent a jar of Ole Henriksen's Truth Revealed Super Creme SPF 15 to review. This product retails at $45 for 1.7 oz. This rich anti-aging crème—leaves the skin with a light sheen and luminous glow. It hydrates and soothes skin while fighting the signs of aging as it firms, boosts cell proliferation, and scavenges free radicals. 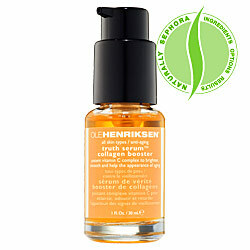 Truth crème is ideal for all skin types, with SPF 15 protection and the exact aroma of Ole Henriksen's Truth Serum. *The Skin Cancer Foundation recommends this product as an effective UV sunscreen. I love the fact that this is formulated without any of the "nasties." With daily use I do see my skin getting brighter- I'm not sure if that's a result of brightening properties in the formula, or if it's a result of my skin repairing itself after repeated sun protection. Either way, I'll take it! I love the scent of the formula- the best way I can describe it is it smells like orange pez. I like that it has natural ingredients yet doesn't have that herbally scent that many natural products have. When I put this on my skin, it is white, and takes a while to rub in. 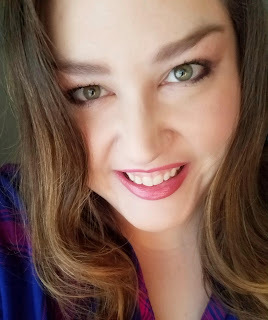 It doesn't just sink into my skin right away, and it takes a minute to soak in enough that I can put makeup on over it. The formula is light in consistency, but still requires some rubbing in. I've always wanted to try Ole Henriksen's Truth Serum. It retails for 1 oz. for $48 at Sephora.com, or for the same price you can buy the serum and get a 0.25 oz sample of their Sheer Transformation if you shop QVC. This tops the list for the next product I want and I already know I'll like the scent because it smells exactly like the Truth Revealed Super Creme! I would highly recommend the Ole Henriksen product I tried. I was sent this product for the sake of a review, but all opinions are honest and my own.